What kid wouldn't like a Transformer chair? In this case, this pint sized chair turns into a single tent bed. I hope its designer, Phillippe Malouin, is planning an adult-sized version. If not, with some planning, foam, Velcro, MDF and fabric, it might be DIYable. What the video below to see the chair transform! Remember when you were a teenager and you leaned back in your chair and how your parents would yell at you for doing so? It was our, 'I don't give a rat's a$$ what you say!' stance and it felt good. Deger Cengiz has figured out a way to let us indulge in that rebellious recline with the Attitude Chair. 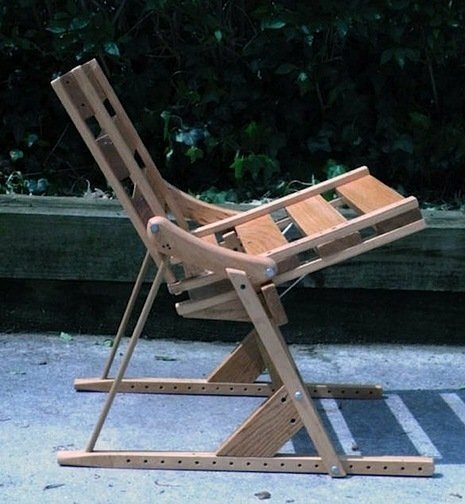 This rubber hose chair created by Wholman from Instructables has been making it's way around the DIY blogosphere this week, and rightfully so. It's clever, unique, and seemingly pretty easy to make. And admit it, if the hose were black and the frame a sleek stainless, you wouldn't balk at seeing this dude in contemporary art museums. A twist on the 55-gallon drum chair design (see below), this oil drum rocking chair from Stanker Collections, "actually connect the form of the drum and the function of the chair in a rational way." And I'm digging on the orange. A realistic goal for a beginning upholstery class is to choose something VERY simple. There's plenty to discover about shape, padding, working the fabric, securing the fabric, tools and furniture structure with a simple kitchen chair or side chair. The Composition Chair, made without any hardware or welding. Aluminum wire. A jig. A pair of pliers. A LOT of crossing and bending. Probably some band aids. Designer Kouichi Okamoto of Kyouei Design created "The Composistion Chair" using only a pair of pliers and a jig to bend aluminum wire. No bolts, soldering, reinforcements, screws, nails, glue, or welding required. Those kids in high school that used to make hand-wound chainmail got nothing on this chair. Sure, we've seen lots of cardboard art and furniture (and a house), and a small scale how-to, but this Instructable is totally approachable and makes fabulous use of a mess of Ikea boxes. Pretty impressive, says I. So grab some corrugated cardboard, a bit of tape, and utility knife, and follow the instructions above. It seems like a good time to share my Mid-Century-Modern Rocket Chair Reupolstery Project. There are numerous photos that tell the story, so I'll make the instructions brief. The Miesrolo Chair by Uros Vitas is made of wood sections strategically placed on synthetic elastomer. The result is a cantilevered chair--that rolls up like sushi--which possesses the strength to support a grown human being. Via. I've spent years dreaming of going to the ICFF in New York. However, after meeting my photo class friend, Nikki, who travels to Milan every April to buy for her store owner, my dreams have changed. Granted, the pressure to sell right now has to be excruciating, but a trip to Milan to buy furniture with someone else's dough??? Come on, let me go. For my money, there is nothing better than an Eames fiberglass (now plastic) shell chair. Eiffel base, with/without arms... I'd take them all. Admit it: you haven't really cleaned up from New Year's Eve yet...which is a good thing, cause you don't have to go digging through the trash to grab those little wire thingys that keep your champagne cork under control to make one of these adorable chairs. All you need is a bottle's leftovers and a pair of needlenose pliers. Have at it, and Happy New Year. Sea-Urchin Chair: Made with Over 8,000 Zip Ties. Studio Ooms fabricated a simply RVS frame and, presumably with the help of A LOT of interns, covered it in 8,000 cable zip ties to create this outstanding chair that looks exactly like its namesake, the Sea-Urchin.